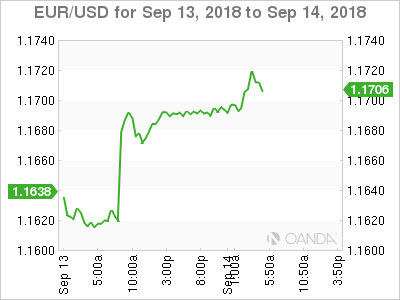 EUR/USD has posted slight gains in the Friday session. Currently, the pair is trading at 1.1712, up 0.22% on the day. On the release front, Eurozone trade balance is expected to dip to EUR 16.3 billion. In the U.S, the focus is on consumer spending data. Core retail sales and retail sales are both expected to tick lower, with readings of 0.5% and 0.4%, respectively. We’ll also get a look at UoM Consumer Sentiment, which is forecast to climb to 96.7 points. As expected, the ECB held the course on its rate policy, keeping the benchmark rate at 0.00%. However, there were some noteworthy items at the meeting. In a slight change to guidance, the Bank announced that it would wind up asset purchases at the end of this year. As well, the ECB will trim its monthly bond purchases from EUR 30 billion to 15 billion, starting in October. These measures mark a vote of confidence in the eurozone economy, which has softened in the second quarter, but still remains solid. The euro moved higher on the news, and the currency has enjoyed a strong week, with gains of 1.4 percent. The ECB reiterated that it will maintain monetary policy “through next summer”, so there is little chance of a rate hike before the second half of 2019. German ZEW economic surveys are well respected and often have an impact on the movement of the euro. Earlier in the week, ZEW Economic Sentiment improved in September, but remains mired in negative territory. The indicator came in at -10.6, posting a decline for a sixth straight month. The survey press release noted that during the survey period, Turkey and Argentina saw their currencies plunge, and German industrial production was soft. On Thursday, German Final CPI dipped to 0.1%, down from 0.3% a month earlier. In the U.S, the red-hot labor market continues to be the envy of industrialized countries around the globe. The unemployment rate is at a remarkable 3.8% and unemployment claims were almost unchanged at 204 thousand, another excellent reading. Despite the strong employment front and a booming economy, inflation remains well short of the Federal Reserve’s target of 2 percent. In August, CPI and Core CPI came in at 0.1% and 0.2%, respectively, falling short of their estimates.